It's a new year and challenge #9 is up today at The Creative Type. 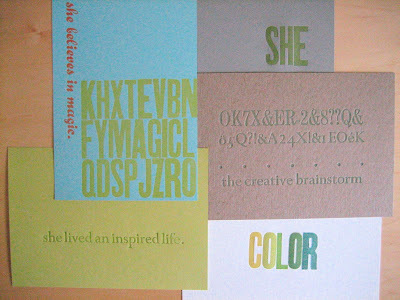 Be sure to go check it out and participate for your chance to win some super rad letterpressed goods from Elise! 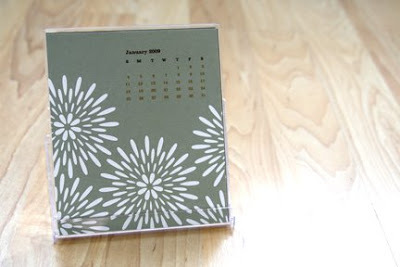 A big reason I've been looking forward to January is that I finally get to break out my 2009 Egg Press calendar. 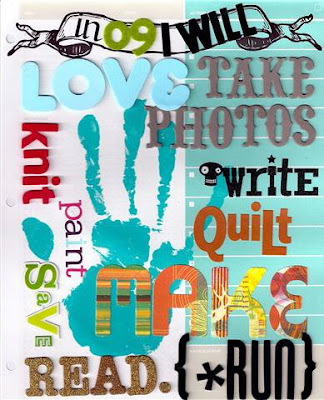 I have a little project of sorts that I hope to make using these little pages as each month passes ... I'll post that later. You know I'm not just going to throw them away! 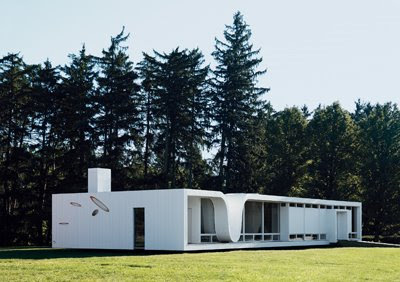 We got our latest issue of Dwell and we so want to live in this house. And maybe it's just that time of year, but I've been feeling like I've been bombarded by infomercials. So now I feel that I must have these. And this. It sanitizes grout and floors and pillows and bedding and I just know it would make cleaning the bathroom so much less dreadful. 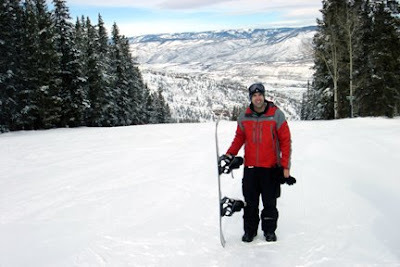 Bo returned safe and sound and injury-free from snowboarding in Colorado. Next time, we decided we need to go during the X-Games. 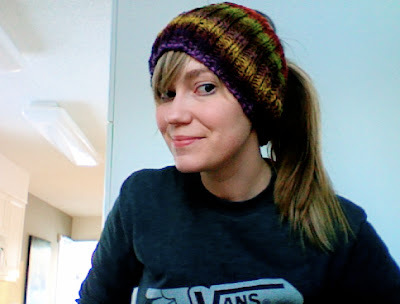 Over the weekend, I finished knitting my Calorimetry. Thanks to much help and guidance from my friends Amy and Sarah! Check out how theirs turned out here and here! It's like a headband/earwarmer. Perfect for people who wear their hair back all of the time. Like me. Or people who have bad hair days but need to go to the grocery store. Like me. 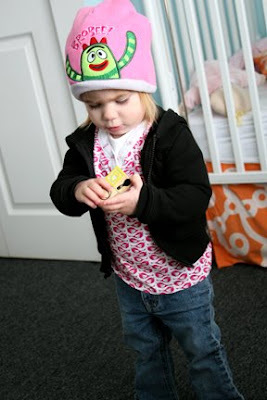 I used Noro Kureyon yarn (and so did Amy – I give her credit for the idea.) Love how the colors slowly show up (I was knitting a row and all of a sudden – holy yellow!) and it's so fun to see how it changes as you go. I added two buttons to attach the flaps behind my head. It turned out to be a little bit big so this will keep the ends secure. 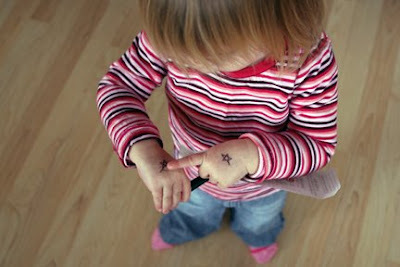 Another creative mind in our house is our future Kat Von D. Lo is obsessed with tattoos drawn on with pens and markers. She asks for a pen twenty times a day and she'll write on her own hands and anyone else who will let her. If we need a bribery tool, we offer to tattoo her hand with a star or a heart and then she'll do whatever we ask. Bo usually gets more adventurous and writes O-Z-Z-Y on her knuckles. On Friday night, we bravely took Lo's crib apart, assembled the new toddler bed and attempted her first night without being behind bars. (Prompted by a crib escape the week before.) 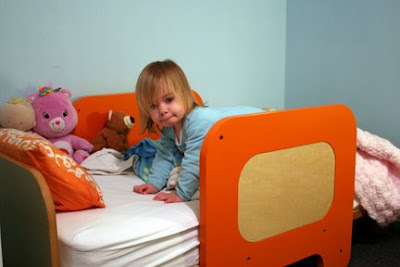 She was so incredibly excited about this new bed that we thought we may just be in for an easy transition. But after five tries and two hours (she'd lay down and be fine for five or ten minutes, then get up and cry by her bedroom door – poor kiddo) we gave up. We pulled the crib parts back into her room, slid the bed back out, but the crib back together, and the child slept in heavenly peace. We'll wait and give it another try in a few months after her birthday...wish us luck. 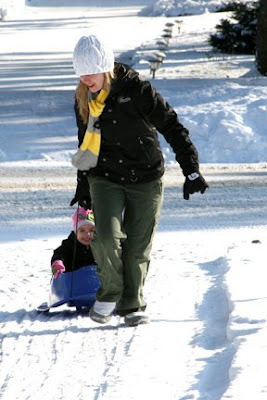 And yesterday, we had a snow day! 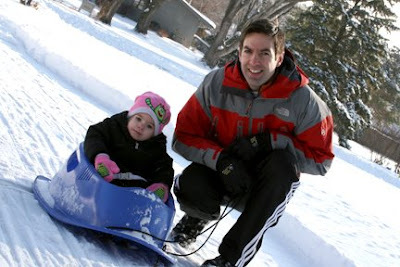 We broke out the sled and had a blast in the fresh snow and sunshine. One last note... thanks so much for all the sweet comments on my last post about my new adventures with The Dares. Each one made me smile. Hi! I'm new to reading your blog but I found you through the dares. You have a beautiful fam and I really dig your work! I'm sure I'll comment often, hehe!! oh i want that house too. and i love your page!!! love it! 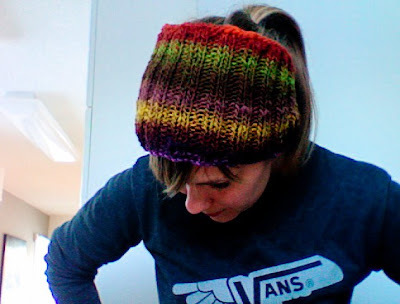 calorimetry was one of my first knitting projects!! diggin the calorimetry...time to break out the needles again...thanks for inspiring me. Oh and little L is way cool and she prolly doesn't even know it. looks like a lot of great stuff going on! and a lot of fun. when we put our son in a toddler bed...we read him a story untill he fell asleep every night for a while and that helped. calorimetry?! what a crazy name... btw it is awesome, love that yarn :) good luck with your future tattoo-artist! Great news to hear about the Dares! Love your new hat, earwarmer, headband! Stay warm!! I love that first collage. You are suuuucchhhh a good scrapper! I'm really digging that calorimetry... 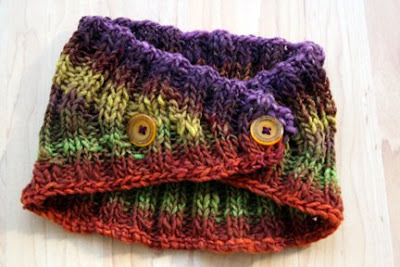 I think that may be one of the first projects I do when I finally start knitting again.